You're getting a lot of camera (and software) for your money here, with a large sensor, generous resolution, great screen and intuitive touch interface. Beginners and pros alike will find plenty to enjoy as, as well as reliably producing top-notch shots, it's great fun to use. The lens priority mode is a particular highlight, and should do much to help less experienced users produce the kind of results that fear (or ignorance) of aperture settings might previously have put out of reach. It's got the same sized sensor, the same resolution, and bears more than a passing similarity to its predecessors. So what's so great about the NX300? The sensor is new for starters. The resolution's stuck at 20.3 megapixels (producing 5472 x 3648 snaps), and its physical dimensions still match APS-C, but it's now faster to focus, with combined phase detection and contrast AF marking your quarry in less than a tenth of a second. It's accurate, too, with an excellent hit rate in picking your subject out of its surroundings, and even if it doesn't, the touch screen lets you tap wherever you want it to direct its attention. The screen itself is wider, stretching 3.31in (84mm) from corner to corner. That's about 10 per cent larger than its rivals, and while it might not sound much, the difference is obvious. You have more room for menus, and when you're shooting widescreen movies they aren't letterboxed between black bars. The touch surface is reassuringly firm, so you won't damage the underlying AMOLED display, which is bright and easy to use in direct sunlight. It's also articulated - a first for Samsung's compact system camera line-up - with a strengthened strut on the back to withstand years of folding in and out. The motion works only on the vertical plane, so while you can't fold it around corners you can tilt it up and down for shooting overhead shots at concerts or discreet hip-held snaps on the street. If you're a fan of the latter, you should probably choose a less stand-out colour than the cool white body and lens option, which we have to admit looks great. Your alternatives are black or brown, with all three finished with a faux leather skin. The UI is attractive, and chunky enough to make it easy to target specific options with a quick tap. It's also fast enough to stay in sync with your finger as you drag through options, settings and shots in review. On this latter point, though, we do miss the old-school scroll wheel on the back of the NX210, which has disappeared in the rush to implement touch in as many respects as possible. Swiping your pictures might be more intuitive, but scrolling them was often faster - especially when you're not zoomed out to the thumbnails. You can't fault Samsung's build quality. The overall styling has been steadily refined since we met its genesis, the NX100, three years ago, so if you're upgrading from last year's NX210 or the nigh-on identical NX200, it will immediately feel familiar. It's a little chunkier than many rival CSCs on account of the larger sensor and screen, but none of that space feels wasted, and the whole chassis has been capped by a brushed aluminium top plate. It's a great retro flourish. It ships with a choice of lens: either the 18 - 55mm unit bundled with our review sample or a shorter 20 - 50mm option. They offer 3x and 2.5x zoom respectively, equivalent to 27.7 - 84.7mm and 30.8 - 77mm on a 35mm camera. In each case, maximum aperture stands at f/3.5 at wide angle and f/5.6 at full telephoto, both of which are pretty much par for the course in lenses of this calibre. Either should be good to get you going, but if you plan on building up a healthy lens library over time, the NX mount line-up is growing and now includes a 45mm prime lens built exclusively for the NX300 for shooting 2D and 3D movies and stills. Out in the wild, the 18 - 55mm barrel performed very well, smoothly sidestepping the most common pratfalls such as distortion and excessive chromatic aberration or focal fall-off towards the corners and edges. However, shooting a target in studio conditions did reveal some barrel distortion on examining the RAW files, which had been accurately flattened off by the in-camera JPEG conversion. You can buy an adaptor that will let you fit Pentax K-mount lenses, but doing so means you'd miss out on the most compelling feature of many of Samsung's own-brand barrels: the iFunction control system. This centres on an iFn button on the side of the lens itself that pulls up a context-sensitive menu through which you can tweak aperture, shutter speed, white balance and so on, simply by turing the focus ring at the end of the lens. It's intuitive and very quick to implement, and means you can dial in changes without moving your hands away from the shooting position. The result should be fewer missed shots, or at least fewer shots taken with sub-optimal settings simply because you hadn't had time to navigate regular menus. iFunction has been extended on the NX300 to introduce a new “lens priority” mode, which supplements the existing PASM, scene and auto positions on the top-mounted mode dial. This is a blessing for green-fingered snappers as it uses the same twist-to-set analogy for selectively defocussing your subject's surroundings, which means novices no longer need concern themselves with aperture settings and which end of the scale delivers the shortest depth of field. There's plenty of help for beginners elsewhere, too, with the regular scene modes - night, sunset, landscape and so on - supplemented by more creative options, such as light trace, and a smart waterfall option that shoots multiple frames and overlays them to blur the motion of the water. It works well, but you'll need to use a tripod for best results. Colour reproduction was good throughout our tests, indoors and out, and under both clouds and clear skies. Even in low light they didn't wander from their true tones, and the level of grain was well controlled at all but the highest sensitivities. Sensitivity picks up at ISO 100 and runs through to ISO 25,600 - twice the level its predecessors achieved. Naturally at the lower end of the scale the results are entirely grain-free, and although you'll start to notice it creeping in at ISO 800 it's very light and largely confined to flat surfaces. This is well compensated for by the JPEG conversion if you're shooting that format on its own or as sidecars to the raw originals. Even at ISO 3200 fine detail remains clear and easy to make out, so it's only if you want to achieve a specific effect or force a particular set of shooting parameters that we'd recommend routinely switching ISO out of auto. You can shoot movies directly from any regular shooting mode at 1920 x 1080, 60fps progressive. If you've invested in the 3D lens the frame rate is halved. The results are on par with its stills, with accurate colours and a good level of detail throughout. The soundtrack is cleanly recorded too, so long as you're not standing in too stiff a breeze, as even with wind cut active it was still audible on the soundtrack. It's got Wi-Fi built in - b, g and n standards - with a dedicated Wi-Fi stop on the mode dial pulling up various sharing options, including backing up to SkyDrive - although there's no bundled account upgrade as there was for Dropbox with the Samsung Galaxy Camera - sharing on social networks and emailing. You can also shoot remotely using a smartphone and automatically back up your shots to your computer. In previous models, this latter option only worked with Windows; here, it's been extended to the Mac. There's also an NFC module built in to one end of the chassis that lets you share your shots with a suitably-equipped smartphone or tablet. All-in-all, then, it's a well-specced and very rounded package that excels in most areas and stumbles in pretty much none. About the worst criticism we could throw at it is the fact that there's no external charger, although you can buy one as an extra. This is a shame in a high-end camera like this as it means you have to charge the battery in place using the bundled adaptor and Mini USB lead, which effectively puts it out of action until the charge has completed. With a separate charger, you can leave it indoors re-juicing your power pack while you slip in a spare battery and head off for another day's shooting. 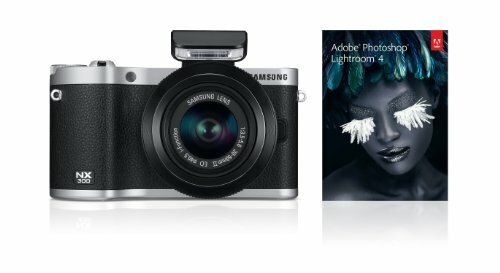 Even here, though, there's adequate compensation, as Samsung hasn't skimped on in-the-box software, which runs to a full copy of Adobe Photoshop Lightroom 4. That's by far the best bundled app yet shipped with a camera of this class, and when you take off its high street price it make the NX300 look even better than its headline price suggests. The NX line-up was already strong, and the NX300 solidifies its position as one of the best compact system camera options currently on sale. There's a pretty heady mix of specs inside its beautiful retro body, with - to coin a cliché - something for everyone. For the pros, there's a large sensor, top notch low light performance, and of course the bundled Lightroom software. The new lens priority mode should prove a fillip to beginners as they strive to achieve more artistic results, and for everyone else there's the touch interface, larger fold-out screen, iFunction system, versatile Wi-Fi, the list goes on (and on and on). The headline price should give its rivals pause for thought, as none of them ship with so impressive a software bundle, and that needs to be taken into account in the final analysis. So, it's a solid 4.5 stars for the NX300, and so close to a clean sweep that it's easy to recommend without hesitation.